As signing day approaches, Head Coach David Cutcliffe and the Duke coaching staff are looking to hold onto each of their 20 current verbal commitments and hoping to add another impact player or two to the class of 2011. This past weekend, the Blue Devils hosted four of their current verbal commitments in Lucas Patrick, Blair Holliday, David Helton, and Jamison Crowder. BDN checked in with the visitors to get their thoughts on the visit to Durham and the Duke program. Lucas Patrick is a 6’4” 285 pound senior offensive lineman from Brentwood, Tennessee who committed to the Blue Devils back in May. 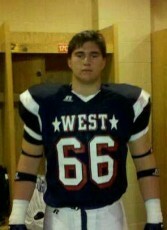 After leading Brentwood to a district title, Lucas played for the West in the annual Tennessee East-West All-Star Game. 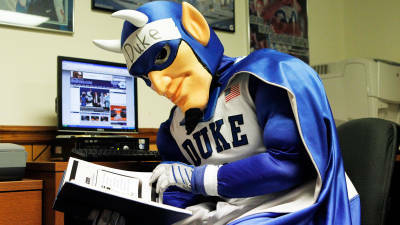 He spoke with Blue Devil Nation after his official visit to Durham. BDN: Can you briefly recap your recent official visit to Duke? It was a great trip! Everything about it was great! Showed up Friday, just hung out with the coaches a little bit, went to dinner. Dave Harding was my host, and we hung out in his dorm, went around campus, just meeting a bunch of the guys. Saturday, we did a bunch of the tours and went to the basketball game, which was a complete blast – seeing Cameron Indoor like that. Then we went out that night. And then Sunday I met with Coach Cutcliffe. It was just a great weekend, I can’t think of one thing that went bad. BDN: You mentioned you were able to meet some of the other Duke players; can you tell us a little bit about whom you met and what you talked with them about? Some of the other players who were visiting with me were Blair Holliday, David Helton, and Jamison Crowder. I got to hang out with them, just riding on the buses to places, sitting there at night when we got in and just talking. Some of the players I got to meet were – the other two that I mainly hung out with were John Coleman and Perry Simmons. Both of them were just great guys to hang out with and talk, get a good insight on the team and how everything went. It was just great overall, especially with those guys – they were some good guys to meet. BDN: You also mentioned you were able to meet with Coach Cutcliffe and had dinner with the other coaches; were you able to talk to them about the program and your role going forward? It wasn’t really – I mean, I got to talk with Coach Luke about some football and all that, but with Coach Cutcliffe, he really just shared his idea for the team and where they were headed. He got me so fired up, just sitting there talking to him about the team and how they felt about this season, and how the commitment to winning is so great now and the whole team is ready to win and is so committed to what he believes. It’s just really good to hear that. BDN: Can you tell us a little about how your senior season finished up? My senior season – I just had a complete blast. It was fun hanging out with the guys, and we won our district for the third year in a row, which is a big thing because we have a pretty tough district to go through. We ended up getting knocked out of the first round of the playoffs, but as far as myself, my senior season went great. I had a bunch of accolades and just improved in a bunch of stuff over this season as far as my game in general. BDN: What are your plans for the rest of your senior year? I’m working out every day. I just came back from an hour and a half workout and I’m going to go run later today, so I’m going to be hitting it hard. I want to go up there and not miss a beat and go ahead and be able to get working with the team and everything. I’m really focusing on my school work, especially classes that I’m struggling in so I can come in there with great school work and a great work ethic. BDN: That’s great, Lucas. Thanks for speaking with me and enjoy the rest of your senior year. Yes sir, thank you so much. Lucas Patrick is a 6’4” 285 pound senior offensive lineman from Brentwood, Tennessee who committed to the Blue Devils back in May. He checked in with BDN this week to update Duke fans on his senior year and his commitment. 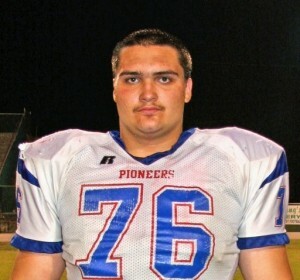 As one of the top ten college prospects in the state of Tennessee, Lucas has anchored the offensive line for the Bruins, even filling in at center for an injured teammate. “I feel like I’ve really improved at everything,” he said as he gave BDN a midseason evaluation of his personal performance. “My versatility is better; I filled in at center when a guy went down and ended up grading out at 94% for that game. I’ve been consistently in the 90s most of this year.” He was named the BancorpSouth Player of the Week for his efforts at center in Brentwood’s 42-0 Homecoming win over Gallatin. Lucas added that he may start at center again next week against Hillsboro due to injury, and with the graduation of senior Bryan Morgan, don’t be surprised if he takes some snaps at center during 2011 training camp at Duke. Despite the 1-4 start, Lucas has really liked what he’s seen from the Blue Devils so far in 2010, and was even able to take in the week 2 game at Wake Forest. 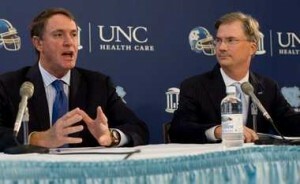 “My sister goes to Wake Forest, so I was actually able to see that game, which was a great game to watch,” he explained. “Duke never gave up and they showed they’re a tough team. I was then able to watch the Alabama game on TV and saw the same thing. They never stopped fighting, which was really cool to watch.” Lucas has kept in close contact with the Duke coaches, most notably Coach Luke, Coach Hardegree, and Coach Roper through phone calls and emails. Lucas plans to take a visit to Duke next weekend for the Miami game with his family, and confirmed that his only visits this fall will be to Duke. 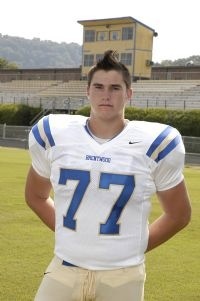 The Blue Devil Nation can look forward to seeing Lucas graduate in the spring and join the Duke program in the summer of 2011 as part of an impressive offensive line class for Coach Cutcliffe. Lucas Patrick is a 6’4” 287 pound junior offensive guard from Brentwood, Tennessee. In 2009, Brentwood finished second in the Tennessean’s year-end mid-state poll, falling one game short of the state championship. Lucas received the team’s Junior Weight Room Award, anchoring an offensive line that helped senior RB Jeremy Coffey run for a school-record 1596 rushing yards. On the field, Lucas says, “I like to be physical, come out and hit somebody.” With Brentwood’s option-style offense, Lucas is able to get downfield and make big blocks for the running game. He hopes that he is thought of as someone who “plays smart and is a team player.” For his senior year, Lucas is looking forward to becoming a leader on and off the field. “I want to get the best out of my teammates and be someone who makes them work,” he said. 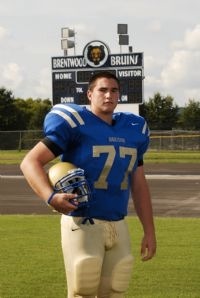 With Lucas leading the offensive line in the option-style attack, Brentwood has their sights set on a state championship in 2010. For his college choice, Lucas is “definitely looking for a good academic school.” He prefers a campus that is “not small, but has a real sense of community.” And of course, he’s looking to compete on the field for an elite football program. As an offensive lineman, Lucas says he has learned to value “camaraderie among the players - where everyone’s got your back.” He’s looking for a coach who will be a person and a coach, not just a disciplinarian on the field. “I have a top list of schools, and Duke is the top right now,” Lucas said about the schools he’s considering. He’s received interest from Cincinnati, Vanderbilt, and Tennessee, and also holds offers from Duke, Middle Tennessee, Western Kentucky, and Arkansas. This spring, Lucas enjoyed visits to Duke, Cincinnati, and Vanderbilt. After discussing football and faith with Duke offensive line coach Matt Luke and team chaplain Mitch Mitchell, Lucas felt strongly that Duke was a place where he would fit, but he came away most impressed by the Duke players. “The players did not hesitate to talk with me, they didn’t even wait for a coach to introduce us. 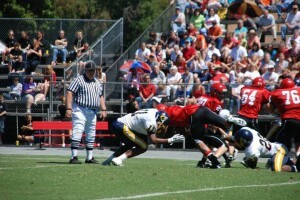 They came up and talked to me on the sidelines during practice,” he said of his visit to Duke for the spring game. Lucas is in the first week of spring practice and is looking forward to visits from coaches during the spring evaluation period. He is waiting to hear how serious Tennessee is with their interest, and intends to make his college decision by the end of spring practice so that he can focus on his senior year. Lucas added that he definitely intends to attend Duke’s summer camp.